In many African countries that receive Global Fund grants, implementers may not take advantage of the services their Supreme Audit Institutions (SAIs) could provide. This is one of the key findings of a study conducted by Aidspan on the involvement of SAIs in auditing Global Fund grants. SAIs, which go by various names in different countries — e.g. Office of the Auditor General, National Audit Office — may provide substantial value by helping improve grant implementation. 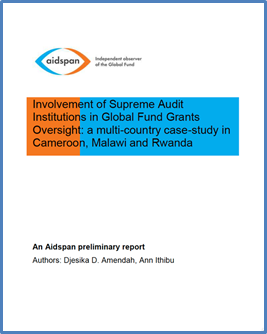 The report on the study, which can be found here, is based on case studies conducted in three countries: Cameroon, Malawi and Rwanda; plus information provided by the Global Fund Secretariat and the Office of the Inspector General (OIG). The study was carried out with the support of the BACKUP Health, a global program working on behalf of the German Federal Ministry for Economic Cooperation and Development. Since 2013, the program has been co-funded by the Swiss Agency for Development and Cooperation. The countries chosen are low-income and high priority for BACKUP Health. The Global Fund Secretariat requires that grants be externally audited yearly by a reputable institution. Guidance by the Secretariat does not insist on which institution, private or public, should conduct the audits; rather, it appears that the Secretariat mostly cares that a quality audit is conducted. In addition to these yearly audits, the OIG audits grants periodically. In most African countries, under dual track financing, a state institution — often the Ministry of Health — is a principal recipient (PR) along with a non-state recipient. The state PRs typically manage the highest share of the grants. In the three countries studied, state PRs manage between 90% and 100% of the grants. (The country at 100% is Rwanda.) In the past, medications or money thefts, fraud and mismanagement have most often occurred under the watch of state PRs, as several OIG reports have documented. National SAIs are empowered to audit state institutions that receive public funds. “In an ideal situation, the SAI will audit these grants and identify potential problems before they happen,” said study co-author Djesika Amendah. The report found high-level involvement of the SAI in Rwanda but little in Cameroon and Malawi. In Rwanda, the Ministry of Health is the only PR. The Global Fund grants are audited by the Office of the Auditor General which reports findings to the Parliament. “The Rwanda situation reinforces country ownership,” said study co-author Ann Ithibu. In Cameroon and Malawi, the SAI is not involved in the Global Fund grants; grant audits are conducted by private entities. Regrettably, those audit reports are not in the public domain, contrary to the reports on audits conducted by an SAI or the OIG. However, other forms of collaboration with in-country oversight exist. In Cameroon, where the Ministry of Health is an implementer, its internal audit unit is involved in oversight and collaborates with the OIG during its audits. In Malawi, the Anti-Corruption Bureau has collaborated with the OIG to campaign against drug thefts in public facilities in the country. While this study focused only on three countries and as such is not a representative of all countries in Africa, it nevertheless raises issues that deserve to be explored further, the authors stated. Aidspan plans to provide a French-language version of this report in the near future.